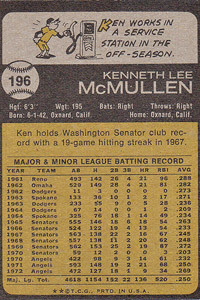 The back of Ken McMullen's 1973 baseball card has a little cartoon that shows him holding the nozzle to a gas pump (he's wearing his baseball uniform, naturally) with the caption: "Ken works in a service station in the offseason." McMullen had nine-plus seasons in the majors at the time, but when they're spotlighting your winter job in the petroleum dispersal industry, it is probably a good indication that you'll soon need new summer employment, as well. Not that McMullen's offseason work was all that unusual. Nolan Ryan says he worked in a gas station one winter when he was a young player, beginning his shift at 3 p.m. and closing at 9. He also installed air conditioning one winter, which means the Hall of Fame pitcher who so famously brought the high heat in the summer evened things out by installing cool air in the winter. "It was interesting because you'd go into new houses and see a lot of different designs," Ryan told me. "You would install it and turn it on, make sure everything worked, and if it didn't, you tried to figure out what the issues were before the service man came over. It was something new for me, so I enjoyed it." Topps Ken probably wishes he had been born a couple of decades later. That was the way it was back then. When the McMullen gas station card came out, the major league minimum was $15,000. My father earned more than that as electrical superintendent at an aluminum plant, and our family was definitely not rich (the six of us, plus our dog, crowded into one old car without air conditioning for our summer vacations). The average major league salary was about $36,500, which was very good pay (the equivalent of about $175,000 in today's money) but wasn't the sort of money you and your family, let alone you and your posse, could live on for the rest of your life. My friend Scooter still vividly recalls a Sporting News photo of Harvey Haddix that showed him delivering heating oil. The caption was: "Harvey is looking forward to spring training." Yeah, I bet he was. Those days are long gone, though. The big league minimum is $400,000, and the average salary last year was more than $3 million. When you earn that kind of money, you don't sell real estate in the winter, you buy it -- and preferably on the beach with enough room for a 4,500-square-foot guesthouse. Former Pittsburgh third baseman Richie Hebner might have worked at his father's cemetery in the winter, but the only graves the current Pirates dig are their own, and strictly from April through September. Sure, plenty of minor leaguers still work other jobs in the winter, as do some fringe major leaguers who aren't guaranteed a big league job heading into the season. And although some players run companies and foundations that take up some spare time, they to do so by choice (Edgar Martinez owned an embroidery company). But it's been so long since established big leaguers had to work in the winter that they likely commuted together in bullpen carts. "You're probably talking the early '80s or the late '70s," said former big leaguer Jeff Reboulet. "I just think most everyone put the effort into getting ready for the season." Reboulet should know. While he was in the minors, he worked at a jewelry store where you needed the boss's approval to sell anything bigger than 1 carat but gave it up after he became established in the major leagues, where teammates wore earrings bigger than a carat in each lobe. In 12 major league seasons from 1992 to 2003, Reboulet was usually among his team's lowest-paid players (his highest reported salary was $575,000), and he says that if he didn't have to work in the winter, he doesn't know who would have. He now provides financial advice for 30-40 active players as co-owner of the Horizon Wealth Management firm, and they don't work in the winter, either. "They aren't working in the offseason unless they want to," he said. I don't begrudge the players their salaries. Better that they get the money than some billionaire owner who will simply keep it while laying off several hundred employees. And with that kind of money at stake, they should spend the winter staying in shape rather than working the graveyard shift somewhere. Still, I can't help wishing baseball had a few moonlighting Grahams left. I mean, wouldn't you love to be able to pull into a gas station and ask Tim Lincecum for some high octane? Or to have seen Roger Clemens not only pulling a tractor with his teeth but planting winter wheat while doing so? Or getting to tell your neighbors that Dustin Pedroia got in his winter conditioning by installing your air conditioning? On the other hand, I probably would not like to walk into the DMV and see Manny Ramirez at the only open window. You know the routine. I give you a fragment from an old box score and challenge you to figure what game it came from and why it was significant. I give this one a difficulty of 4. Topps What? They couldn't have gone with a classic Lou umpire tirade? After years of relying mostly on posed portrait photos for their cards, Topps began experimenting with "action" photographs in the 1970s. The problem was there wasn't much attention to quality control. 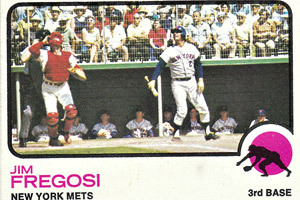 For instance, this card of Jim Fregosi (1973 Topps No. 525) captures the player in the dramatic act of hitting a foul popup. 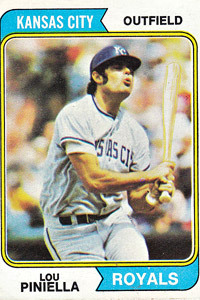 And then there is this one of Lou Piniella (1974 Topps No. 390). If definitely does not look like Lou got a good swing at that pitch, though of course who really knows, given how blurry the photo was. And these weren't unusual cards. While leafing through a box of early '70s commons at DJ's Sportscards last week, I found three cards showing players popping out, one of a player scurrying back to first on a pickoff and one of a player dodging a throw. • Baseball and football remain tied in the World Series vs. Super Bowl parity battle. Baseball has had 14 different teams in the past 10 World Series, and the NFL has had 14 different teams in the past 10 Super Bowls (I'm including next week's). • Complaints about Oscar snubs are a little like All-Star Game snubs. You can't honor every good performance, but with both ASG rosters and the best picture list expanding, there are fewer snubs. Some claim Mark Wahlberg should have gotten a best actor nomination, but I wasn't overwhelmed by his performance in "The Fighter" (Christian Bale, however, was fantastic). Plus, he has to make up for all his wooden performances in recent years -- his "performance" in "The Happening" alone should keep him off any Oscar list for another five years. Meanwhile, I'm wondering what Helena Bonham Carter did in "The King's Speech" to deserve a nomination. Her nomination makes her kind of the Matt Thornton of this year's Academy Awards. Topps Capturing the infield fly rule on film is never your best photographic option. • Here's the rule in our house: My wife says the Christmas tree must come down by the day the Boy Scouts come by to collect them, usually a week after New Year's. I say they can stay up until pitchers and catchers report. As usual, she won. I didn't give you a lot of information, but there was just enough to figure this one out. As you could see, Philadelphia's Rick Wise hit two home runs in this game (June 23, 1971). What you might not have known is that Wise also pitched a no-hitter that day, for what might have been the greatest all-around performance in baseball history. Wise hit two home runs in another game two months later, but he also gave up three runs and eight hits in that game. He hit 15 career home runs. Caple's Off Base: Who needs the Yankees? Caple's Off Base: Betting for tickets? Caple's Off Base: Fogerty's "Centerfield"